The arts have been part of First Congregational Church dating back to the 19th Century. 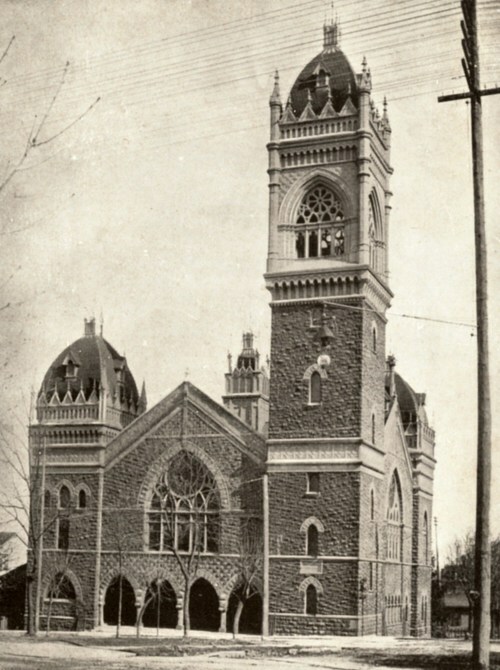 According to the records of the Oregon Historical Society, on Tuesday evening, September 14, 1875, The First Congregational Church Art Gallery had an exhibition entitled: “Views in Oil, Pieces in Marble, Natural Curiosities, Etc., Etc., Etc.” We have played a signiﬁcant role in the arts in Portland, even so much as to lay claim to be the oldest continuous art gallery in our city. From the last quarter of the 19th century though the 1920s, art exhibitions, plays, concerts and recitals were not uncommon at this church. In 1951, A Cavalcade of Faith took place at the Portland Civic Theatre, a drama based on the history of First Congregational Church. Throughout the 1950s, the Scrooby Players were known for their regular dramatic presentations. In the last years of this decade, the Chancel Players brought drama to the sanctuary, primarily at Easter time. Fine Arts Banquets were held in 1959/60, encouraging a fellowship of members interested in the work of the arts in the church. This was encouragement to The Walker Players, a drama group, which performed plays with a religious theme. A good example of the quality of their work was the performance in 1966 of JB a play about the biblical story of Job by the well-known author Archibald MacLeach. A citywide Festival of the Arts was held at the church April 11-17, 1964, and it included performing arts, visual arts and lectures. The 1970s were marked by the formation of M. A. D. (Music Art Drama). During this decade, drama, arts and crafts exhibition occurred regularly. Medieval Winter Revels were celebrated in conjunction with Park Block organizations. And our church celebrated its 125 Anniversary in 1976, an occasion which also included the arts. By 1983, Mothers Against Drunk Driving (MADD) gave reason for our church to change the name of our work; it became ArtReach in 1985. We developed policies regarding art exhibitions at the church in order to encourage artistic expression, to uplift the arts, and to encourage communication through non-verbal forms for the sake of the enlightenment and enjoyment of all. ArtReach was led by a committee of twelve through the 1980s. Park Block Revels, the Oliver Lectures, plays, mystery dinners, concerts and recitals were organized. Art exhibits were displayed on the walls of Fellowship Hall; they included the Names Project Memorial Quilts in 1985. A sacred dance group performed in the early 1990s. In the mid-1990s First Thursday receptions served as openings for the exhibitions in Fellowship Hall. Examples of these shows were: Social Justice Issues, Youth with Mental Illness, Muslim-Jewish-Christian Perspectives to Build Bridges, Sermon on the Easel, Middle East Peace Quilt, and Russian Icons. ArtReach evolved into an art gallery by 2006. Art exhibitions were hung for one month with a First Thursday art reception in concert with galleries in our city. Exhibitions included a variety of visual arts, both two and three dimensional work, by artists from within and outside the church, from Salem, OR to Seattle, WA. Elaine Molskness served as coordinator from 2007 through 2016. In January 2017, Dr. Sheldon Hurst became Curator of the ArtReach Gallery. An educational component was established for the exhibition schedule: an ArtReach Gallery website was created; exhibitions are two months long; interpretive booklets accompany each show; a curator’s event accompanies each exhibition. The gallery was updated with a new lighting system and with an electric drop down screen.